Looking after your pooch is a fulltime job and taking care of their teeth is something you need to be aware of. It may seem like an obvious thing to do but so many people consider almost everything but still by-pass doggy dental care and it can cause so many issues for your four-legged best friend. Neglecting your dogs teeth can be much like not giving them worming treatments; if it's not something that you keep on top of it can be a nightmare to fix, really very unpleasant and even painful for them! The visible tartar build up on your dogs teeth is made up of 80% bacteria and this has a knock on effect not only to the health of their gums but also the bone beneath and ligaments that hold the teeth in place. It can access the blood stream and infect vital organs including the heart, lungs and kidneys making them more poorly than you ever realised - all simply because of avoiding dog dental care. Follow these basic tips to help keep on top of your dogs dental hygiene and support their dental health. This might not sound like the most fun of tasks but it's certainly an effective one. Cleaning your dogs teeth with a toothbrush specifically designed and made for dogs can make all the difference when it comes to saving their teeth from extreme dental work. Read this guide on brushing your dogs teeth. One of the easiest things you can do to promote dental healthy in your dog is to use treats specifically formulated to keep teeth and gums healthy. 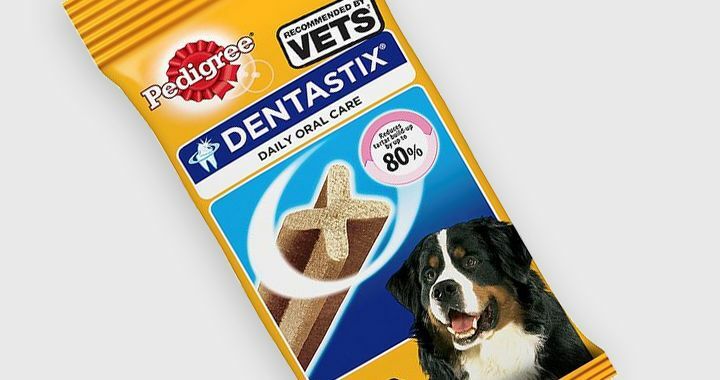 From experience, Pedigree Dentastix are the best because they work and dogs love the tasty treat. Giving your dog one Dentastix a day can make all the difference when it comes to keeping their teeth clean as not only do they reduce the build-up of tartar thanks to the shape and texture but they also contain ingredients that combine with the calcium in saliva to slow down the build-up of tartar in the first place. There is also a version available that tackles fresh breath and works incredibly well at doing so. Read more Pedigree reviews. Offering your dog a healthy diet is not only good for their general health but also their teeth and gum so by feeding them a mixed diet you're giving your pooch so many health benefits. So try feeding your dog a combination of wet food and dry food with dog treats of a responsible amount (not human treats). Our food and drinks can contain a number of ingredients that aren't good for your dogs health or their dental hygiene like caffeine, sugar, dairy and so many other things that are potentially harmful so stick to specifically designed dog treats just to be safe. Taking your dog for routine check ups is important anyway, even without specifically considering their dental health but by having a vet check over them he or she will be able to determine any existing issues they may have with their teeth and gums or spot something that could become a problem if not better taken care of.